It's the last weekends of September, almost the same time as last year. After a couple of dodgy days in the week, the weather turns for the better, a break in the clouds is expected. The Saturday night curry is marinating, all we have to do is find a place to go. Plan was to follow the weather. After a great weekend at the Gower last year we fancied a bit of Cornish Granite, however by Friday there was still no clear indication from the Met Office as to where was going to be best, Bad weather, a 5hr drive, and the thought of us sitting in a fetid wet tent for 2 days was starting to loose it’s appeal. Lets be realistic we gotta go somewhere a bit closer. 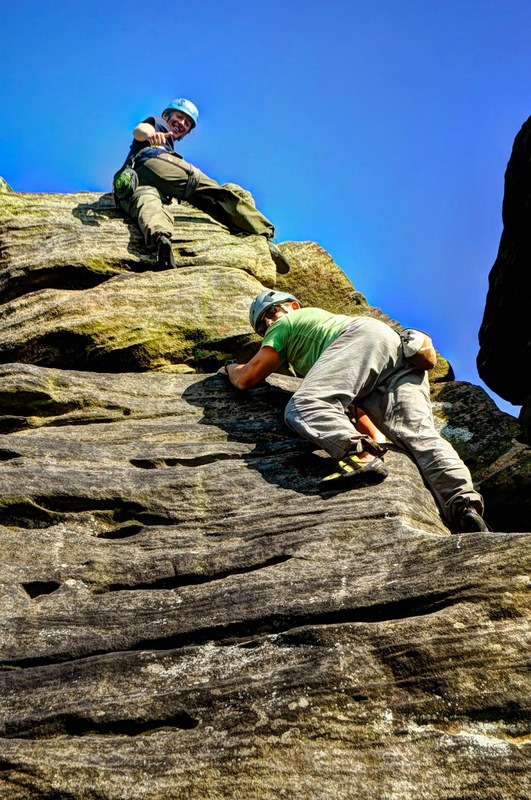 Granite…..grinite….grinit….gritit….grit….grit….Fek .Peaks bloody peaks lets go to the bloody peaks stop farting around. Quick find a campsite that allows FIRE, ooooohhh not many, and those that do are too far away. After some mild panic we plumbed for Knotlow farm campsite - http://www.knotlowfarm.co.uk/home £35 per night for 5 of us all in, and you can park by the tent they will even supply fire baskets and wood/charcoal if we need it. Cracking little site, near the village of Flag, it’s got Yurts as well if you like that sort of thing. 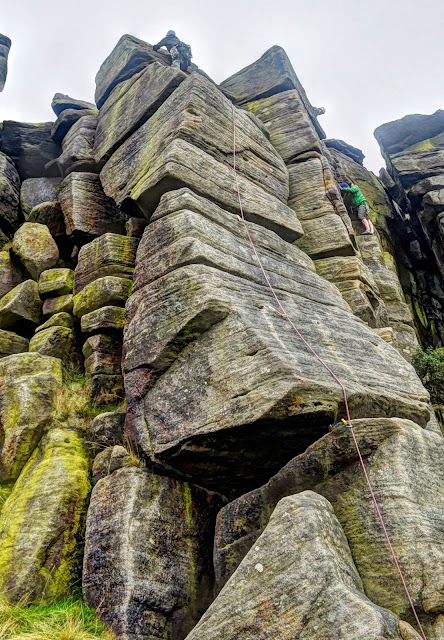 Daymo, Deej got up there on the Friday and pitched the tent, bit of time left in the day for them to get up onto Stanage Popular band do few routes. 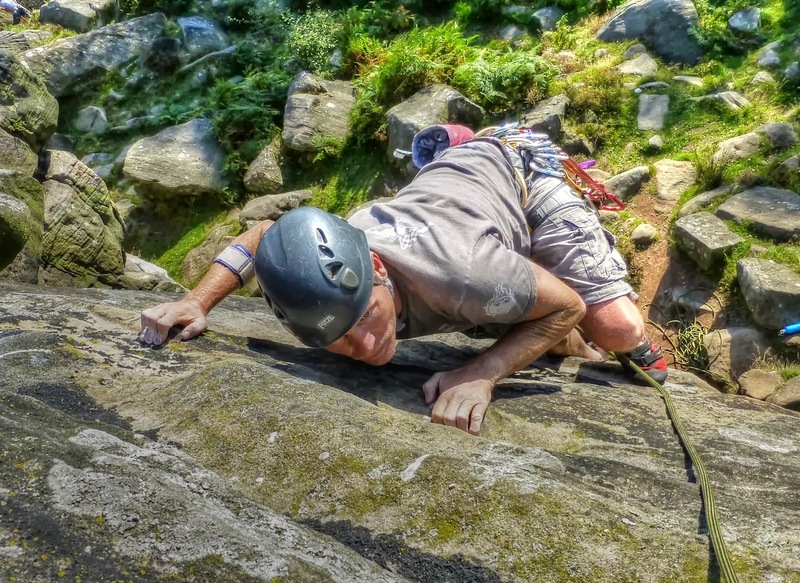 Few routes ehh… Daymo and Deej only do the lovely ‘Inverted V’ VS 4b and ‘Robin Hood Cave Innominate/Harding's’ HVS 5a. Matt and Len arrive on the Friday evening. My plan is to drive up early on the Saturday morning just in time to have a majestic warm bacon butty placed in my hand. Heading out of Leek on the A53 the dopey morning mist is swirling round Hen Cloud. Ramshaw’s razor profile graphically pierces the skyline, Jesus that place can look like the set of ‘Pitch Black’ bbrrrr…all it needs is a Vin Diesel hurting towards me wearin a pair of goggles he found in a cracker. After some serious avoidance driving trying to not run over the scores of rabid DofE candidates piling out of school busses, bang on 9am I’m sitting by the tent eating me butty, mmmmm a well timed breakfast there Lenny boy. Trying to prize the bits of bacon from between my teeth I inaudibly say “Suppoaws we awt to think about some cliding, eybody gof a pleference”? 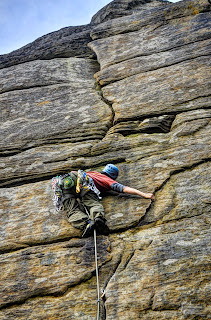 With no real concise decision and the cloud still a bit undecided, we head off for Hathersage, might get an idea of where’s clear on the way. After neatly reversing into the car behind, we pop into Outside for a bit of gear perving. Ooooh… lovely shinny precious things. I buy a big Yellow sling and a tay Shirt, as if I aint got enough. At the till, unknown to me, the chaps are all standing behind me in a line with the same bright Orange shirt. “Rob! we all wanna look special like you’se….” It’s still early on an expectedly stressful Saturday morning but the guy behind the till is genuinely laughing. We drive up towards Stanage, still a fair bit of cloud; no surprise Burbage North is full of groups, so we head back toward Plantation. It’s a good choice, it’s relatively quiet. Don’t forget the sandwiches. 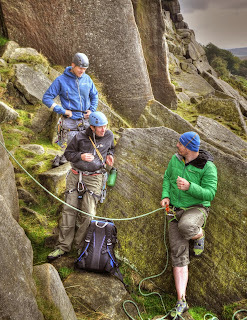 It’s still a bit wet so we warm up on a few V Diffs / Severe.on Fern Crack. Even after a pretty good summer it’s still wet and green. Our attention moves towards Goliath’s Groove. As we arrive Deej is already making a fine go of The Coign HS 4. Damian has a big grin on his face and seems to have stopped climbing, this usually means one of 3 things, 1) He's having a poo, 2) He is teaching a group of pretty girls how to climb, or 3) He has just seen a climbing legend. It’s No 3, in of all the grit joint in all of the peaks Andy Kirkpatrick is climbing here today with Ella & Ewan…. and why not. 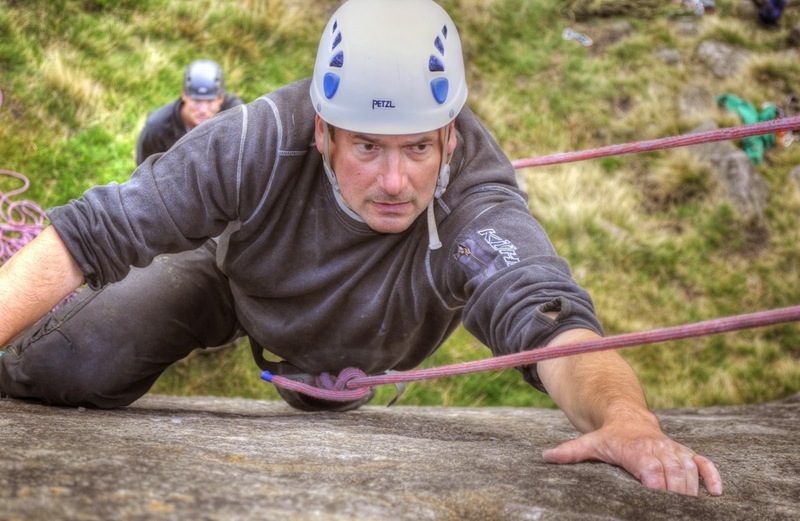 Deej has just finished ‘Cold Wars’ and having really enjoyed Andy’s infectious humour at one of his climbing road shows, I’ll say it again ‘what a nice bloke he is’. We have a good chat and then shove off further towards Fairy Steps. But not before Damian does his favourite trick of pushing for the BFF photo opportunity. How the hell he gets “Rob, show Andy your calf muscles” into the conversation I still have to remember. The only way to appease Daymo is to let the freak show begin. It’s a calf off….. Andy is much amused and Ella blasts a startled OMG. Ah hemm, put them away now. Still only a few metres away Andy is quite taken by Daymo’s Picnic Basket, an essential piece of kit, fit for purpose. 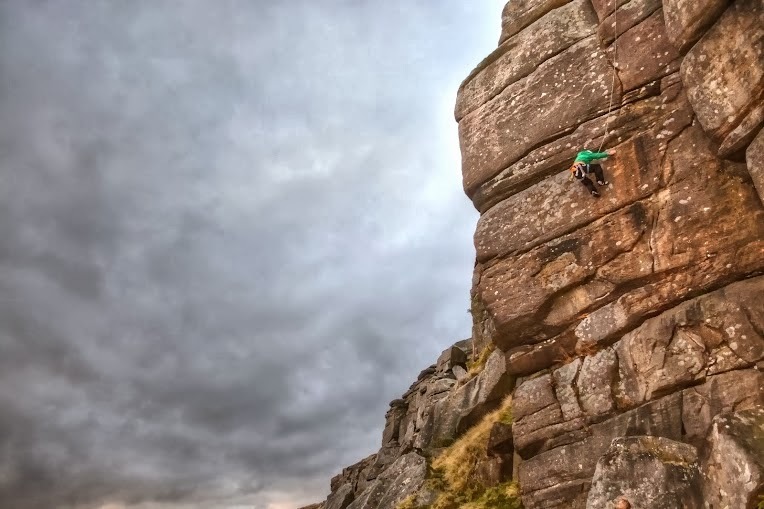 Damian has made too many Ham & Cucumber sandwiches and he makes me eat another, but full marks for transporting a flappy sandwich up to Deej belaying Len on top of Fairy Steps VS 4. Tis warmin up a bit now. Me and Matt are on Stirup Severe 3c and I finish on Ride Him Cowboy VS 5a and Corduroy VS 4c, Warming up the grades now start rising. Deej gets onto Living at Speed E1 5b, its relatively straight forward but for the life of me I cant reach the final critical hold before the top, its just out of dam reach. Tower Face looms over towards the right. 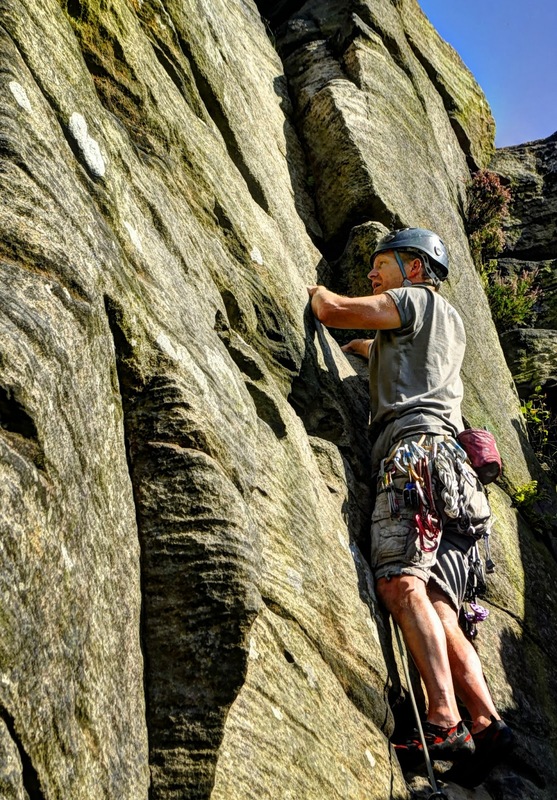 Deej & Daymo have a few bullets left so opt for the 3* Tower Face Direct E2 5b, Daymo gets a couple of pieces of gear in then his blood/sugar reminds him how absolutely very tired he is. 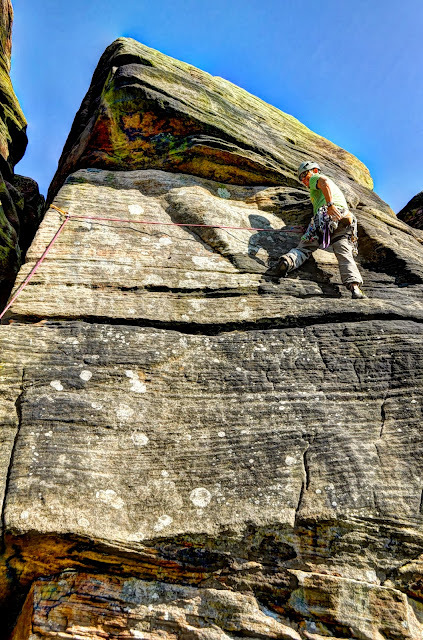 Deej racks up, a few metres up and he’s at the E2 crux, tentatively negotiating the awkward moves, he relishes the rewarding gorgeous flake and pop to the top. I get the easier 2nd and spend a good bit of time retrieving Daymo’s cam. I’m glad I’m on a rope for the E2 Crux but manage it clean. Len repeats. Fair play Deej, a ballsy last route to finish. Curries calling…..
excelled himself again. Back of the throat. The night is almost clear with a full moon, letting the food go down looking up at the stars...ahhh can’t beat this. I manage to rouse myself enough to stagger over to the car. I have something that will mellow the evening, a bottle of Penderyn Welsh Whisky. I was bought this for my birthday and thought I’d bring it along for the weekend. “Hello little bottle of Madeira Single Malt http://www.welsh-whisky.co.uk/ are you going to take the pain away from my armies and leggies”? “dwi yn y dŵr y bywyd, yfed i mi” says the little bottle. Oh goody goody. Lookind dup “Now listed everybody, is it the clowds stanning still and the starth and earth movin or other way roun” There are only Four of us round the fire but Len is sure we are Five, there is something moving in the shadows. “Well there may be a schpooky presence but whatever it is its schnot sleeping in my bag, i’m going to sheep” Gooonigh everyone. 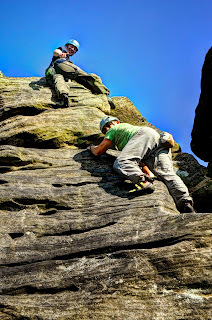 Sunday 24th- Froggatt or Birchen? The lads have pitched the tent precisely aligned with the rising sun. The piercing light is almost unbearable...there was a presence last night but i wasn’t very spiritual, it was toxic and probably a fire risk, the tent smells like a pair of culled badgers underpants..... I’m just going for a walk, i may be some time. Len gets the brekky going, nothing like a fry up with a few sticks with crispy wildlife to start the morning. I think the plan is for Froggatt but our timing is a bit out after an extended lie in. Fortunately is looking like a lovely day, unfortunately there has been a mass exodus from Sheffield, and every parking space anywhere near Froggatt has been gobbled up. We don’t fancy a long walk in so head off down to Birchen. The field is open in front of the Robin Hood pub http://www.robinhoodinnbaslow.co.uk/Robin_Hood/Welcome.html we abandon the cars and head for the edge. Jesus it’s hot, must be up in the mid 20’s. 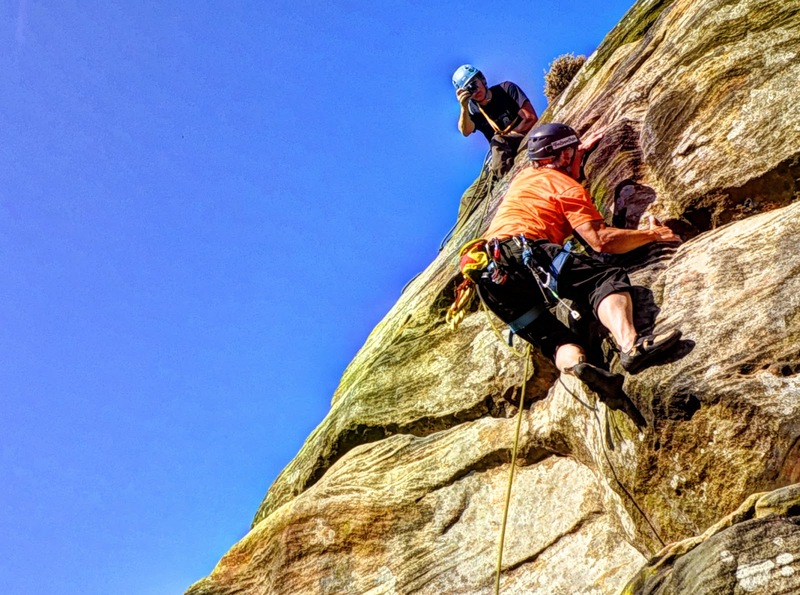 We sweat up a few solo’s on VDiff & Severe, Mast Gully Ridge VDiff , Len & Matt start on Fo’c’sle Crack S4b, Deej and Daymo pootle around on Stokers Wall. 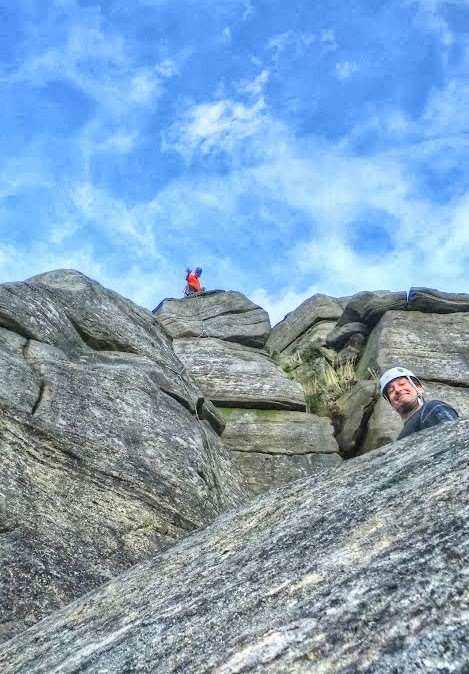 Matt and I pop up Trafalgar Crack & Barnacle Bulge HS4c. has some sparse little moves at the top. Daymo & Deej are now onto Powder Monkey Parade S 4b, a lovely traverse. Time to crank things up a bit, Deej & Len lead Top Sail VS 4c, Daymo and I follow. Still mid afternoon and it’s like high summer. Following savage criticism of Saturday’s sandwiches, Daymo has raised his game. Ham and Cheese and just Cheese by itself, with Rocky Road biscuits for pudding, style. Meanwhile Matt’s looking a shade the colour of his ex AA van, methinks he stood too close to de fire last night. He makes an enforced decision to return to the van as soon as possible, nee even breaking into a run. Andy who popped up with Mickey for a brief climb wants to discus the finer points of the best way home. Unfortunately the awakening UXB in Matt’s belly is now down to the 5 second fuse. 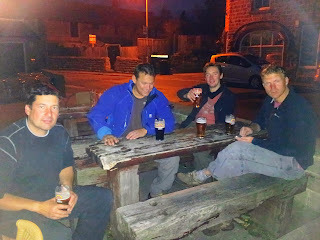 Matt abandons courtesies and makes a dash, I’m glad to say there was a happy ending in the toilets of the Robin Hood…. Back on the rock Len & Deej are up for a couple of last climbs. 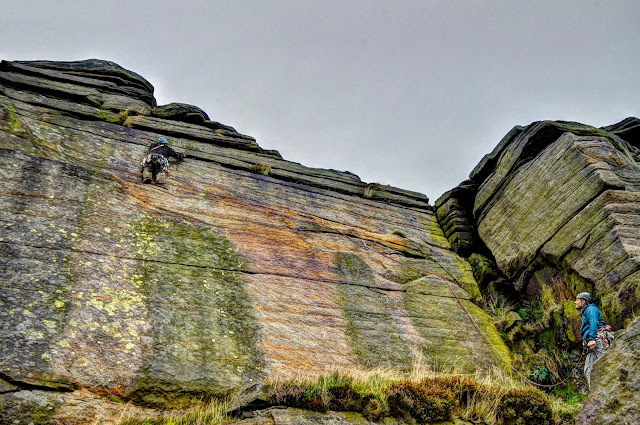 Len & Daymo do Sail Buttress HS4c, Deej goes for Ratline HVS 5b,Talk about a high step finish, Len & I follow on 2nd, this seemingly not too bad HVS takes a fair bit of grunt. Game over we’re heading back.